Closely following the release of Digg and AOL’s Readers, HootSuite is throwing its hat into the RSS ring with the launch of Syndicator. Before making up your mind about it, know this isn’t just a generic Google Reader clone. 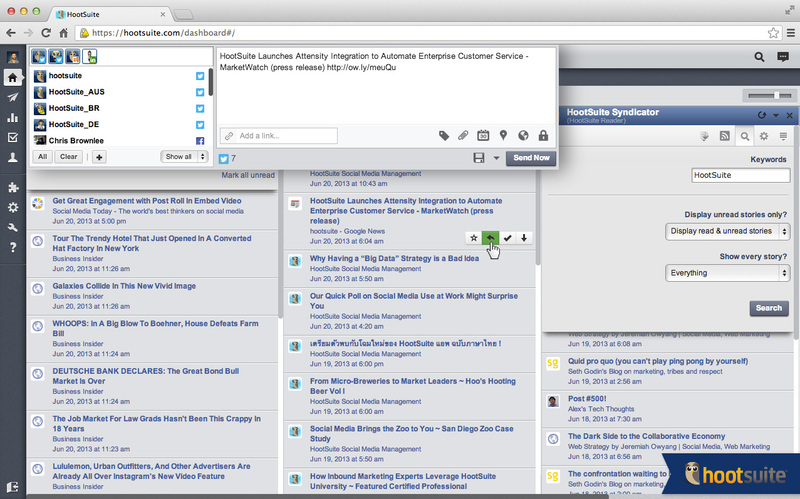 HootSuite is a social engagement service, and this tool was made for its users: marketers and community managers. It’s not for Google Reader’s fleeing user-base. Launching as the 56th service in HootSuite’s App Directory, Syndicator works quite simply: it brings RSS feeds into your dashboard, so content can be monitored and shared with little effort. 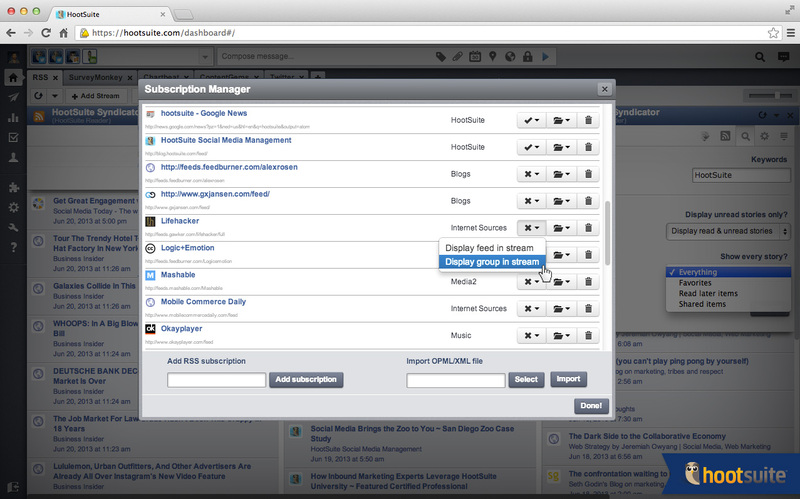 According to Director of Partner Integrations Mark Holder, HootSuite hopes Syndicator will help you “find content that’s relevant to you and your audience.” Holder tells us it is both a reader and a marketing tool. 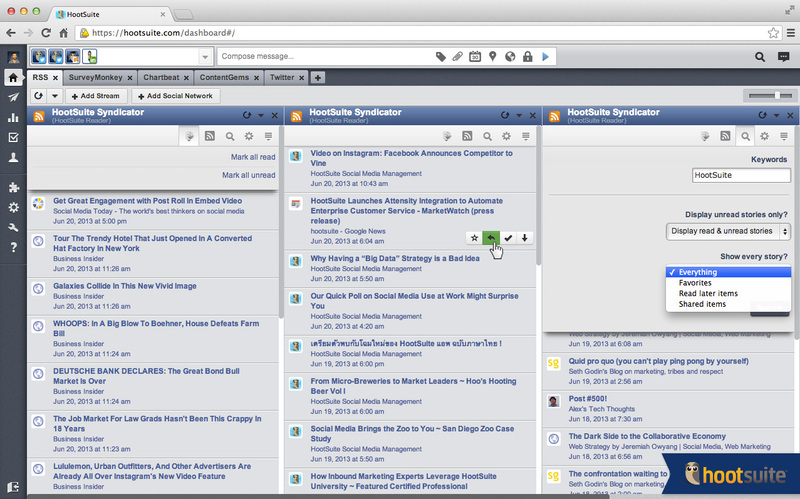 Syndicator expands upon earlier experiments, including the HootSuite RSS Reader, a basic feed monitoring system released in 2012. Google Reader’s demise certainly inspired HootSuite to pick up the project again and make it a full-fledged product, but Syndicator and Reader are entirely different from what companies like Digg, AOL and Feedly are bringing to market. “Our users are constantly looking for ways to bring more and more content that’s relevant to them into the dash,” Holder says. Those under pressure to push content through social channels will find this new app extremely useful in providing them with a library of content they selectively choose to share. Content curation is rising in popularity among brand marketers, even while popular RSS readers are closing down or withering to obscurity. Along with Syndicator, Hootlet, a Chrome extension which previously only let you share links across social media accounts, is receiving an update timed with the launch. 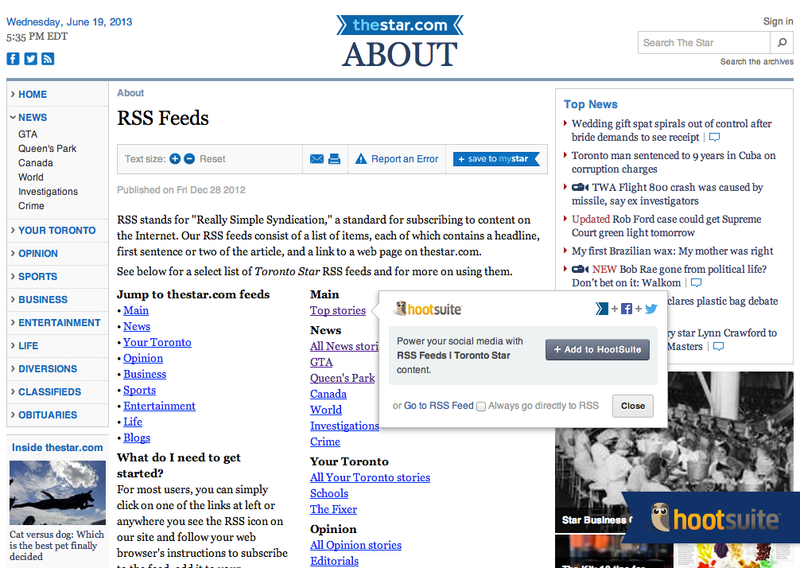 The extension now lets you subscribe to entire feeds while browsing third-party sites. Syndicator is an interesting experiment targeted towards a market that Google Reader never served. It’s a tool that may even play a role in prolonging RSS’ lifespan by putting it in the hands of marketers, but ultimately, it’s not out to battle Digg, Feedly or AOL for the Reader throne.